We Asked The Question 'Who Would Wear A Jacket Like This?' Now We Know! A little while ago, SSRA was seeking assistance in trying to find out more regarding the possible owner of the panel of a shooting jacket, which is adorned with cloth shooting badges, as can be seen in the photograph below. The above photograph shows the back panel of a shooting jacket, bearing various shooting related badges. 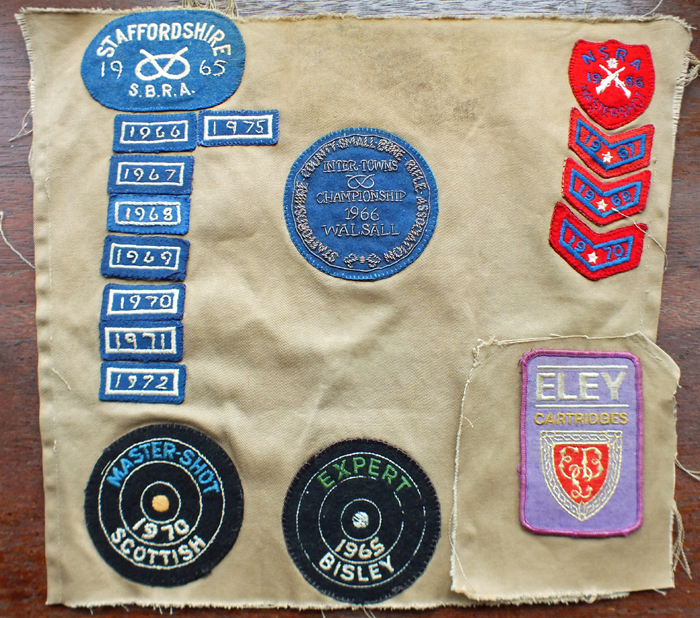 This rather grand array of shooting badges, some of which relate to the Staffordshire Smallbore Rifle Association, plus various other shooting badges, are stitched onto what was once the canvas back panel of a prone shooting jacket. After a bit of head scratching, putting the right questions to the right people, persistence, and a little good fortune, the person to whom the jacket panel belongs has now been found. Dave Bayley, the Trophies Secretary for the SSRA, is also a member of the City of Birmingham Rifle Club. In the course of Dave trying to glean further information regarding the item, Dave played on a hunch that someone at the the recent City of Birmingham Rifle Club AGM may be able to help. Dave duly set off for the AGM, armed with the panel and badges. Also present at the AGM were two City of Birmingham Rifle Club Vice-Presidents, Irene and Terry Ball. At the meeting the jacket panel was held aloft, and the question was raised for any suggestions as to whom it may have belonged. Immediately, Terry Ball said that he thought that it was his. This was re-affirmed by Irene Ball, by the fact that she recognised the stitching of the badges, as she had fixed the badges to the jacket using a 'blanket' stitch. 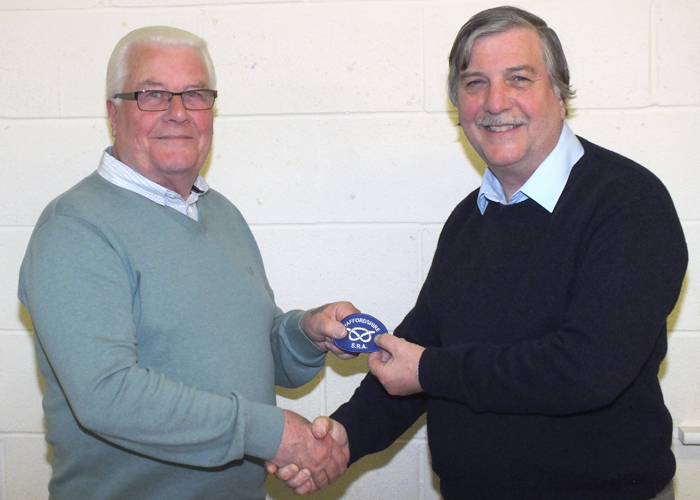 The lone Eley badge was presented to Terry Ball by Tony Walmsley of Eley. So, there we are my friends, mystery solved. Terry Ball is pictured second from the left in the back row of the photograph shown below. 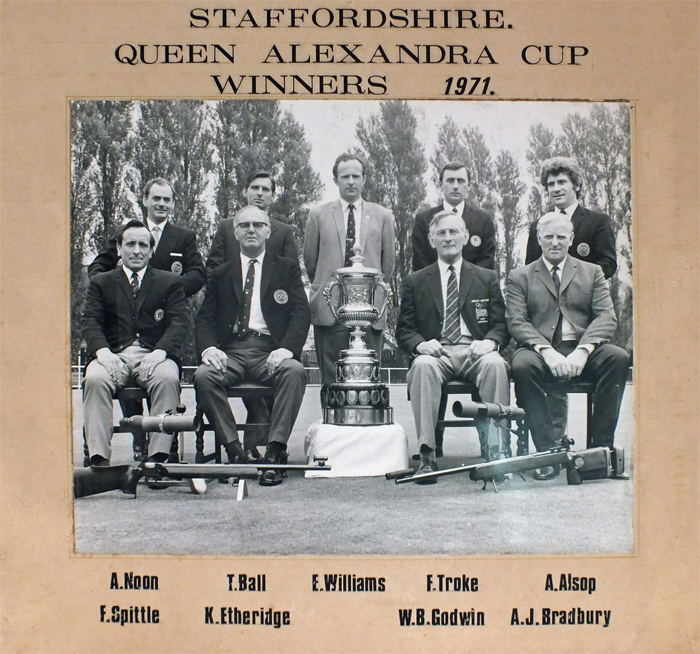 The photograph shows members of the successful Staffordshire Smallbore Rifle Team, as they proudly display the Queen Alexandra Cup in 1971 at Bisley. The above photograph shows members of the successful Staffordshire Smallbore Rifle Team, as they proudly display the Queen Alexandra Cup in 1971 at Bisley. Back Row (Left to Right): A. Noon, T. Ball, E. Williams, F. Troke, A. Alsop. Front Row (Left to Right): F. Spittle, K. Etheridge, W.B. Godwin, A.J. Bradbury. Staffordshire Smallbore Rifle Association regretfully announces the cancellation of the Staffordshire Airgun Championships 2017. The Championships were to have taken place over the week-end of Saturday 2nd and Sunday 3rd September 2017. This unfortunate course of action has been taken due to an insufficient number of entries being received for the competition. However, the SSRA may consider reinstating the Staffordshire Airgun Championships at some point in the future. SSRA would like to apologise for any inconvenience caused by this late cancellation. It is with great sadness that we report the death of Fred Troke on the 2nd April 2017 at the age of 83. He was a member and one time Captain of the City of Birmingham Rifle Club, a life member and former Chairman of the Goodyear Rifle Club, and founder member and President of the Chipperfield Rifle Club. He was also Vice President of the Staffordshire SBRA. In 1974, Fred was elected Walsall Sports Personality of the Year. Fred started shooting in 1952 at GKN Darlaston RC, and obtained his first FAC in 1954. He joined the City of Birmingham RC in 1962, and by about 1972 was in ‘X’ Class and the National Squad, and was chosen to shoot for Great Britain and England on several occasions. He was a regular competitor at the Bisley and Scottish meetings, and although suffering from very poor sight, was still shooting up to the end of last year. 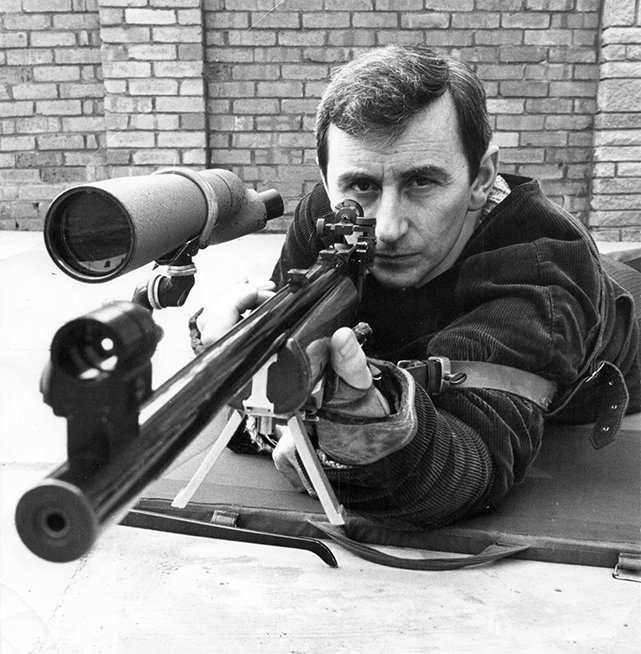 At County level Fred was Staffordshire County Long Range Champion in 1972, 1974, and 1991, and 50 Metre Champion in 72, 74, 82, 83, and 92, Short Range Champion in 1971 and 1974, and Veteran Long Range Champion in 2001. He was a keen committee member and gave sound advice on both shooting and construction matters. He designed and helped build the baffle on the 100-metre range at Aldersley, and prior to the Staffordshire Open Meetings, he and Major (Rtd.) Peter Martin would be preparing the range, staying in a caravan on site and frequenting the local hostelry. Our deepest sympathy goes to his wife Janet and family. Lichfield shooter Bill Hulley, and Leek shooter Martin Jupp, were both highly delighted to have been included as new members of the Staffordshire County Air Pistol Team, which competed in the NSRA (680) Inter-County Air Pistol League 2016/2017 - Division 5. Also, Leek shooter Paul D Barker, was equally delighted to have been included as a new member of the Staffordshire County Air Rifle 'A' Team, which competed in the NSRA (660) Inter-County Air Rifle League 2016/2017 - Division 3. The presentation of the badges to Martin and Paul was carried out by SSRA Airgun Secretary Osborn Spence, at Leek and District Shooting Centre. Bill was presented with his badge by SSRA Airgun Secretary Osborn Spence at Hopwas Scout Hut. 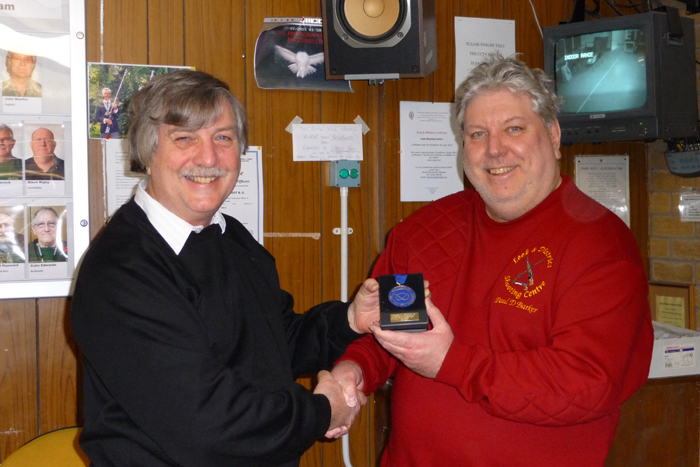 The above photograph shows Bill Hulley (pictured left) receiving his Staffordshire County Badge from SSRA Airgun Secretary, Osborn Spence (pictured right). 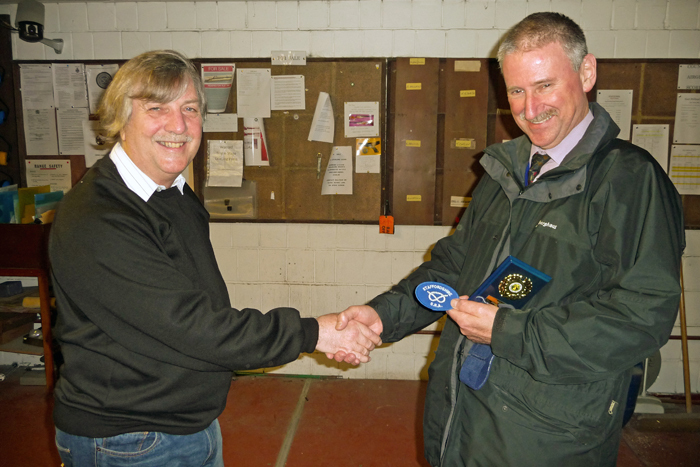 The above photograph shows Martin Jupp (pictured right) receiving his Staffordshire County Badge from SSRA Airgun Secretary, Osborn Spence (pictured left). 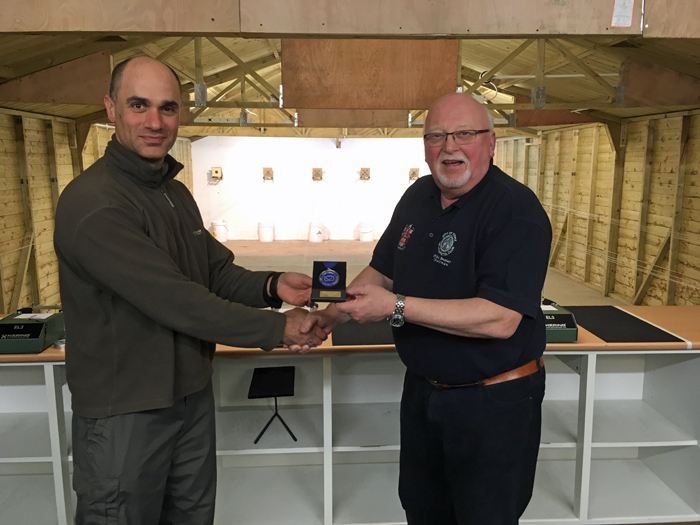 The above photograph shows Paul D Barker (pictured right) receiving his Staffordshire County Badge from SSRA Airgun Secretary, Osborn Spence (pictured left). It is with great sadness that Staffordshire Smallbore Rifle Association confirms the funeral arrangements for former Staffordshire Smallbore Rifle Association Vice-President – Mr. Fred Troke, whom sadly passed away on the evening of 2nd April 2017. The funeral service will take place on Monday 24th April 2017, at All Saints Church, Bloxwich, Walsall, WS3 2HR, commencing at 10.30am. Following the church service at Bloxwich, the funeral cortège will then proceed to Sandwell Crematorium, Newton Road, West Bromwich, B71 3SX, arriving at 11.30am. All connected with SSRA convey their deepest sympathy to the family and friends of Mr. Fred Troke. Adult Members of Affiliated Clubs, Association Clubs and Individual Members of the Association may pay a one-off fee per year of £32.50, which entitles them to as many visits as they wish to make during the year. Junior Members (up to 21 years of age) of Affiliated Clubs, Association Clubs and Individual members of the Association may pay a one-off fee per year of £16.25, which entitles them to as many visits as they wish to make during the year. This fee is due by 1st January each year. Please make your cheque payable to Staffordshire Smallbore Rifle Association. Please include your name, and the name of the Club to which you belong, and a SAE for acknowledgement. For further details of where to send your completed membership form and cheque, please contact via e-mail in the first instance, the SSRA Secretary whom will then forward to you via e-mail all the relevant details. SSRA Air Section - Individual Air Pistol League - Winter 2016/2017 -Winners Medal. The following article appears on the NSRA website, concerning the questions relating to Exemption Certificates and Section 11/4. Recently there has been concern raised over the legislation surrounding the sale and purchase of firearms and the impact of rules such as section 11/4 exemption certificates. To clarify the situation, The Firearms Act 1968, together with amendments, runs to 103 pages. Since the 1968 Act there have been 22 Acts of Parliament amending the original, some as diverse as the Energy Act 2004, together with 13 Statutory Instruments. In 2001 the Home Office issued a document entitled 'Firearms Law Guidance to the Police' which comprises of over 300 pages. It does not cover the six acts and four statutory instruments issued since that date. Exemption Certificates are a small part of the legislation. It is an extremely complicated subject as can be seen from the following paragraphs. A person conducting or carrying on a miniature rifle range (whether for a rifle club or otherwise) or shooting gallery at which no firearms are used other than airguns or miniature rifles not exceeding .23 inch caliber may, without holding a certificate, have in his possession, or purchase or acquire, such miniature rifles and ammunition suitable therefore; and any person may, without holding a certificate, use any such rifle and ammunition at such a range or gallery. Whether approved or not, miniature rifle clubs are entitled to the exemption in section 11(4) of the 1968 Act. Under that subsection a person conducting or carrying on a miniature rifle range (whether for a rifle club or otherwise) or shooting gallery at which only miniature rifles and ammunition not exceeding .23 caliber or airguns are used may, without a firearm certificate, purchase, acquire or possess such miniature rifles or ammunition for them. Whilst there is no legal definition of a miniature rifle, other than one which does not exceed .23 inch in caliber, it is generally accepted that this refers only to rifles firing .22 rimfire cartridges. Persons using the range are exempt from holding a firearm certificate only whilst using such miniature rifles and ammunition at such a range or gallery. Whether approved or not, with or without a firearms certificate, a person may purchase small-bore rifles and ammunition under 11(4) of the Act. You do not need an 'exemption certificate' to claim exemption from the need to have a FAC. It does seem an anomaly which has been around since the 1920 Firearms Act. Do not knock it, it can give a club advantages but disadvantages are present. Looking carefully at the wording 'a person conducting or carrying on a miniature rifle range...' This means that provided you or your club officials are running the range you may take advantage of 11(4). You could not bring the guns to Bisley and shoot in our Championship Meetings because we are 'conducting' the range. If on the other hand we hired you a number of lanes at Lord Roberts Centre and you provided the supervision that would be in order. 3. Any sale of ammunition or firearms has to be face to face except where there is no need to enter the transaction into a FAC (1997 Firearms Amendment Act). With the agreement of the Home Office in the early 1990s the Showmans' Guild of Great Britain and the NSRA were allowed to issue exemption certificates. This means that a club representative can visit our shop or any other and obtain his requirements. Section 8(2)a of the 1968 Act states that it is not an offence for a person to 'part with the possession of any firearms or ammunition, otherwise than in pursuance of a contract of sale or hire or by way of gift or loan, to that person who shows that he is by virtue of this Act entitled to have possession of the firearms or ammunition without holding a certificate.' This certificate 'shows' that entitlement. Logically proof must be required. Before 1968 'Exempt Clubs' had a certificate (with a 2d postage stamp on it) giving power to buy guns and ammunition. Because clubs were not keeping proper records of purchases or sales it was agreed that a FAC would be issued free of charge to Home Office approved clubs to use as a register, just as a RFD has to. Initially the amount of guns and ammunition allowed was 'unlimited' but over the years arbitrary numbers have been imposed. An Exemption Certificate has no such limit. You do not have to enter any purchases onto your FAC, if you hold one. The Home Office issued a document in August 2016 regarding the Approval of Rifle and Muzzle-Loading Pistol Clubs. Under Section 44 of the Firearms (Amendment) Act 1997, a person wishing to possess a rifle or muzzle-loading pistol solely for target shooting must be a member of an approved rifle club or, as the case may be, approved muzzle-loading pistol club. Section 44(1)(b) requires an approved club to be specified on the firearm certificate. The certificate should not list all clubs of which the holder is a member. Any rifle, miniature rifle or muzzle-loading pistol club can apply to the relevant Secretary authority (i.e. the Home Office for clubs in England or Wales or the Scottish Government for clubs in Scotland) for approval. Approval is granted under section 15(1) of the Firearms (Amendment) Act 1988 (as amended by section 45 of the Firearms (Amendment) Act 1997). When approval has been granted, members of that club can possess firearms and ammunition without holding a personal firearm certificate "when engaged as a member of the club in connection with target shooting" (Section 15(1) of the 1988 Act as amended by section 45 of the 1997 Act). Approval also allows the police to grant a free firearm certificate to a responsible officer of the club to enable him or her to purchase and acquire firearms and ammunition for members to use for target shooting. Club members may not purchase or acquire firearms or ammunition unless they have been granted a personal firearm certificate by the police. SSRA Air Section - Individual Air Rifle League - Winter 2016/2017 - Winner's Medal. Staffordshire Smallbore Rifle Association can now confirm the date for the forthcoming SSRA Combined Open Squadded Rifle Meeting. The event will be held on Sunday 6th August 2017, at The Chipperfield Ranges, Baldwin's Gate, Newcastle-under-Lyme, Staffordshire, ST5 5EA. Full details regarding the event will be published in the near future. Continuing the story of the history and development of the Chipperfield Ranges, there was a rather nice article written about the Chipperfield Ranges, entitled 'Meet the Chipperfields' which appeared in The Rifleman magazine - Autumn 1997 - Issue 731. 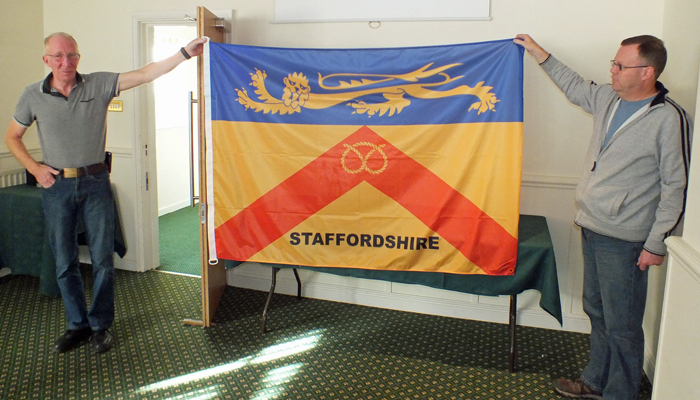 SSRA Committee Members Steve Rowe (pictured left) and County Captain Dave Glover (pictured right) proudly display the new Staffordshire Smallbore Rifle Association Team Banner. Surely, the above photograph is enough to strike fear into the opposition at various shooting competitions in the future. No, not the two chaps from the SSRA Committee who are pictured in the photograph, although they are excellent shots in their own right. But the mere sight of the brand new Staffordshire Smallbore Rifle Association Team Banner being unfurled at competitions will be enough to give the opposing teams the shakes before the shooting commences, as it heralds the presence of the Staffordshire Team. The Staffordshire Smallbore Rifle Association Team when participating in events around the country will proudly display the banner. This will undoubtedly help to further promote the team, and add a touch of colourful charisma to their attendance. This beautifully created cloth blazer badge, with silver bullion wire detailing upon a blue background, depicts the Stafford Knot with the words 'Staffordshire Smallbore Rifle Association' encompassing the central design. This striking design is mounted on a black background to further enhance the badge. 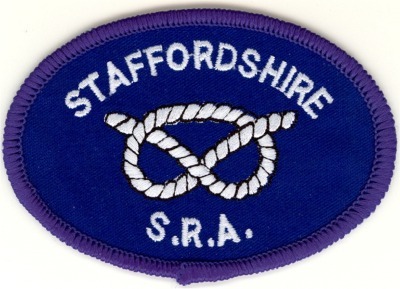 Anyone that is affiliated to Staffordshire SRA, usually through affiliated club membership, can purchase a badge - irrespective of which county he or she may live in. If you would like to purchase one of these very desirable badges, the SSRA has a limited number in stock at a price of only £12 per badge, plus postage. To place your order, and for further details of how to pay, please email your contact details to Trophies Secretary. In the ‘old days’ of the web, to keep track of updates on a website, you had to ‘bookmark’ websites in your browser and manually return to them on a regular basis to see what had been added. 1. You, as the web surfer, had to do all the work. 2. It can get complicated when you are trying to track many websites at once. 3. You miss information when you forget to check your bookmarks. 4. You end up seeing the same information over and over again on sites that don’t update very often. RSS is a technology that provides you with a method of getting relevant and up to date information sent to you, for you to read in your own time. It saves you time, and helps you to get the information you want quickly after it was published. You can easily set up an RSS News Feed account from within your own email programme - for example Microsoft Outlook or Mozilla Thunderbird etc. There are even 'Stand Alone' RSS Readers available to download for free. In addition, web based email providers such as Yahoo or Google offer an RSS Reader service. For a far more in depth explanation of what RSS feeds and readers are all about, please visit the following website: the What Is RSS Website. You can now plan your route to the Chipperfield Ranges by using the embedded Google Map, which can be found on the Contact and Location Details webpage, also on the Facilities webpage.